Despite a few days of hot weather, some cool rain has got river levels not only ideal and a little above where they typically are at this time of year, but the temperatures too are remaining cooler than normal for this time of the year. The Upper Manistee looks good: a nice flow, temps in the mid-60s and with just a hint of color. Hatches are minimal, but look for: caddis, a few Isonycias, Light Cahills, BWOs, and Tricos. The weather has the Tricos a little messed up – look for bugs in the both the evening and mornings – mornings typically being the heavier hatch. Ants, grasshoppers and beetles are around and bringing some fish to the surface, as are foam and rubber leg creations. The Lower Manistee is still offering good trout fishing. Caddis and BWO fished dry, soft hackles swung and tandem nymph rigs fished under an indicator are all catching fish. 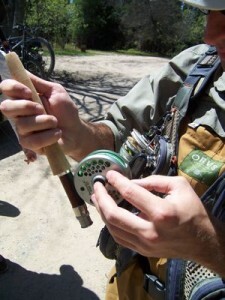 Smaller streamers will get some response from not only trout, but some smallmouth too. Because the temps continue to be below 70 degrees, the numbers of fish just aren’t there. The wind and rain has some salmon in the river but mostly lower in the system looking for well presented streamer fished deep and with some action. The Boardman too is benefiting from the rain and cool weather. It’s really a terrestrial bite right now, but have some caddis flies in your box too. Matching the hatch isn’t much of a factor right now, but have some white flies/Ehphrons in your box as heavier evening hatches should kick off soon. Swinging emergers is a great strategy for this hatch before and during. The Betsie river has salmon in the river with rain and sunlight impacting where you might find them one day and where the next. Remember — these fish are migratory and they are running on the bigger side this year. Hang on and have fun.